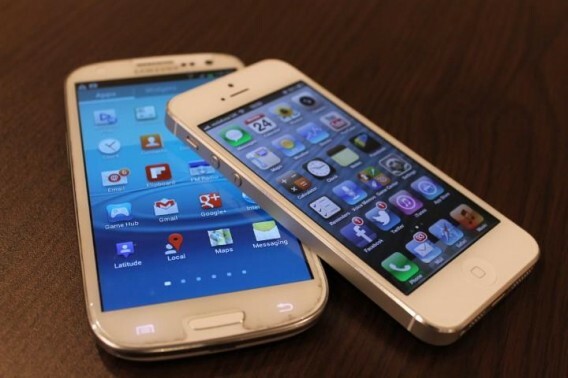 When it comes to upgrading your phone, there’s one very big question that most people have: iPhone 5 or Samsung Galaxy S III? Answering it is not easy. Let’s get one thing out of the way first, the iPhone 5 and Samsung Galaxy S III are both excellent smartphones. Both are top of their class, both very impressive in the experience they deliver, and of that there is no doubt. Screen Size: First, let’s talk about screen size. 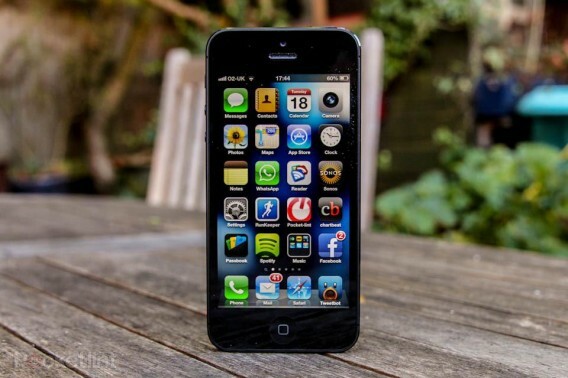 The iPhone 5 has grown, it’s up to 4 inches; the first size upgrade since the phone debuted. This means a taller, larger screen that iPhone fans have been waiting for. 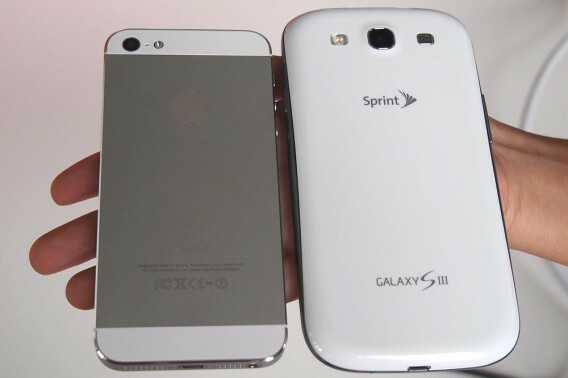 If you want real size, the Samsung Galaxy S3 has the numbers, 4.8 inches to be exact. This is more real estate for your viewing pleasure. Screen Display: With the iPhone 5, you get their well-known Retina display on the 4-inch touchscreen. There is a 1136×640 resolution, or 326 ppi (pixels per inch). There is a fingerprint-resistant coating on the front. 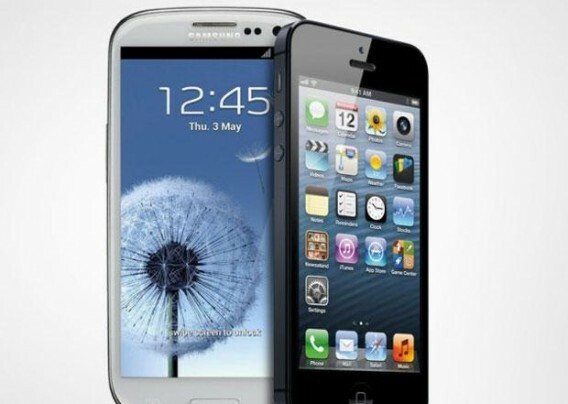 In the Galaxy S3, you get a slightly better resolution of 1280×720, but due to the larger 4.8-inch size the ppi is slightly less. The HD Super AMOLED screen on the GS3 is very bright and attractive. Processor: The iPhone 5, no exaggeration, is lightning quick. Apple did a bang-up job with its dual-core Apple A6 processor, and you won’t be waiting long to do anything. 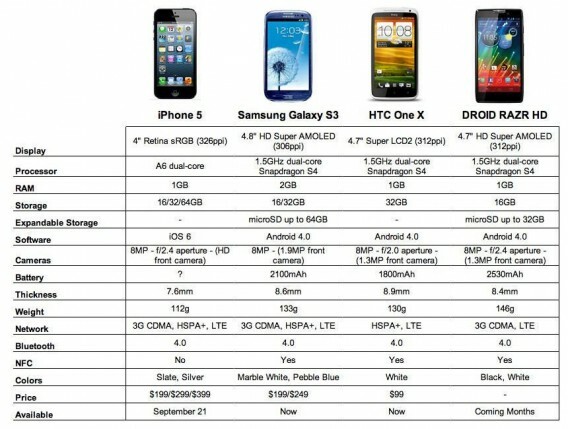 But Galaxy S3 is definitely up to pace, in fact it’s even faster. Its 1.5 GHz dual-core Snapdragon processor is nothing to sneeze at (the European version is even better with a quad-core processor). Multitasking will not slow it down in the least, even if it involves intensive apps such as Pandora Radio or Netflix. 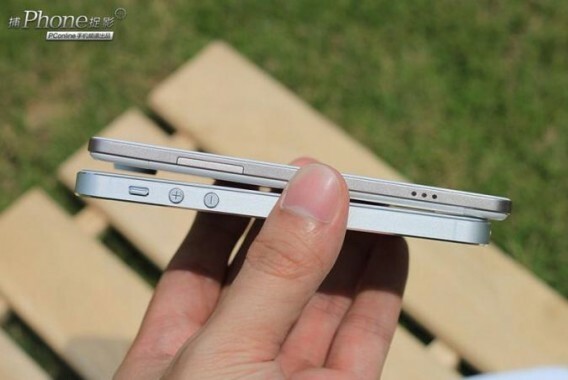 In the area of RAM, the iPhone 5 features 1 GB, but the GS3 features a whopping 2GB of RAM. Storage: You can get the iPhone with various storage levels – 16, 32 or 64 GB, but no upgradability in the iPhones. 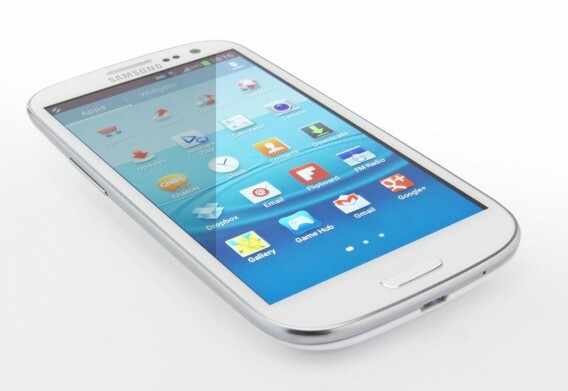 The Samsung Galaxy S3 is available in 16GB or 32 GB options, plus it has a microSD slot, which allows for up to 64GB, so the potential for more storage space is there on the GS3. Battery: 4G phones are notorious for sucking up battery, but with proper management of your features like WiFi and Bluetooth, you can make them last longer. 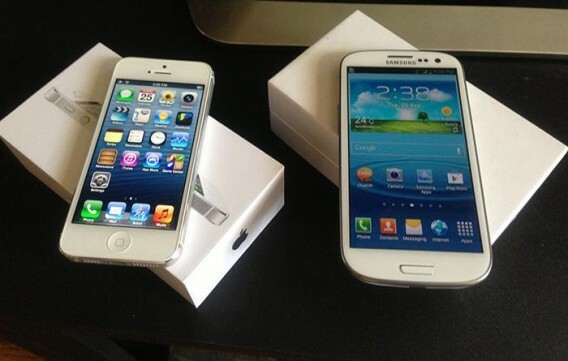 Samsung’s GS3 slightly outlasted Apple’s iPhone in my testing, and both were among the better 4G phones I’ve seen so far. They got me through the day and then some, unless I was just going crazy with my app use. Cameras: More and more these days, people skip the standalone digital camera and rely on their smartphones. As a result, there are high expectations in this regard. 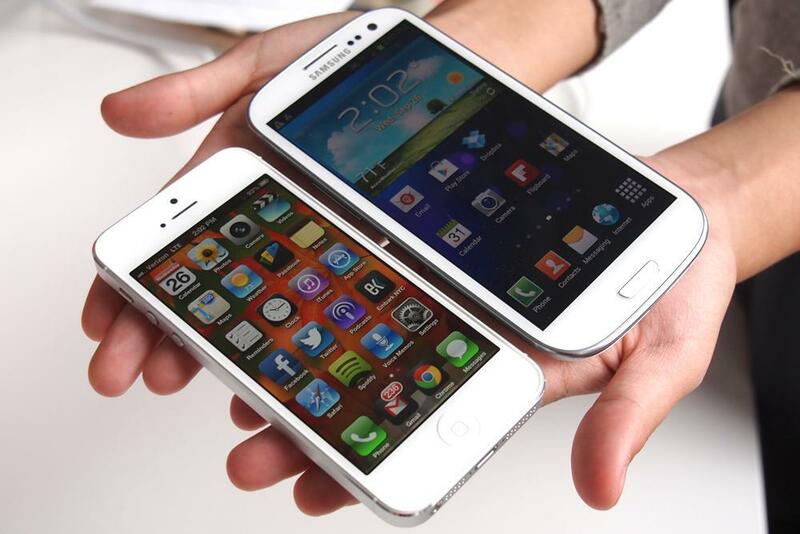 Both the iPhone 5 and the Galaxy S3 have fantastic cameras, and fantastic video quality too. Both devices have an 8-megapixel camera in the rear, as well as crystal-clear 1080p HD video that looks amazing and life-like on replay. They do well in low light, for the most part, compared to previous versions of these phones. In the area of front camera, which is used primarily for video chat, the GS3 does a little better with its 1.9-megapixel camera. The iPhone 5 front camera comes in at 1.2 megapixels. Both phones’ front camera feature 720p HD video quality. Operating Systems: This is really the big difference between these two phones. Apple’s iPhone 5 runs the latest version of Apple’s operating system – iOS 6. This features integration with Apple’s ecosystem – iTunes, iBooks, etc. When you use an iPhone, you’re in Apple’s world. Some people like that, others don’t. With the Galaxy S3, you get Android 4.0 (aka Ice Cream Sandwich), and an update promised soon to Android 4.1 (aka Jelly Bean), and you’re in Google’s world here – Google Maps, Google Voice, Gmail, etc. APPS: Apple, of course, was out with its iPhone before Android phones ever hit the market, so they got a big jump on the competition in terms of having better app selection. And it’s true that pretty much whatever you need to do with an app, Apple’s got you covered on the iPhone. 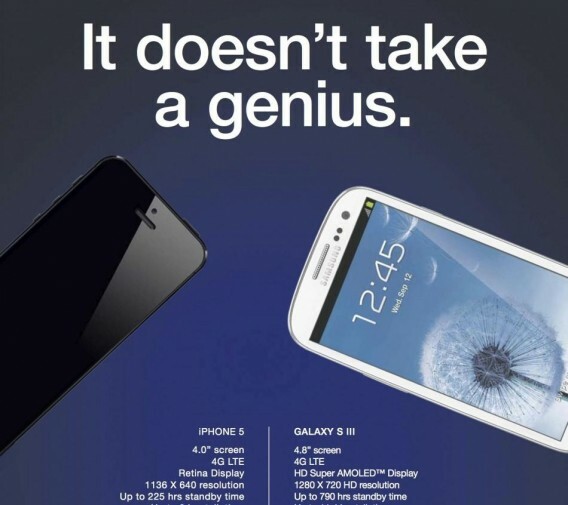 But that doesn’t necessarily mean the Android competition loses this battle. It may have gotten a later start, but in the past several years Google’s Android Market has grown by leaps and bounds, and I would say at this point it’s caught up to Apple’s App Store in terms of offering whatever you might need in the app department. 4G Networks: The big news about the iPhone 5 is that it’s (finally) capable of accessing the 4G networks of its carriers. The iPhone is offered on Verizon, AT&T, and Sprint, who all have their own 4G LTE networks. Verizon and AT&T’s networks are the most expansive right now, and Sprint’s is newer so its reach is limited. 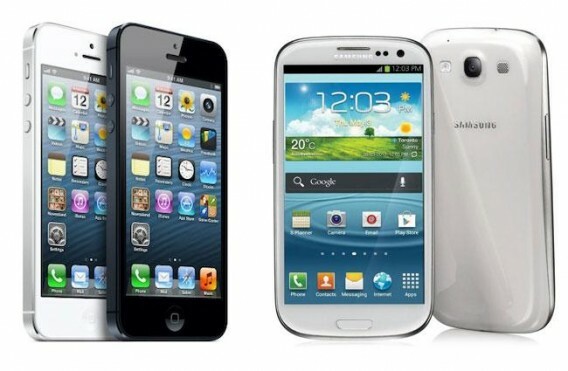 The Galaxy S3 is available on all four major wireless networks – Verizon, AT&T, Sprint and T-Mobile. It’s basically the same phone on all four networks, other than some carrier-specific software that’s included on each version of the phone, plus the fact that it will access a different 4G network, depending which version you buy.